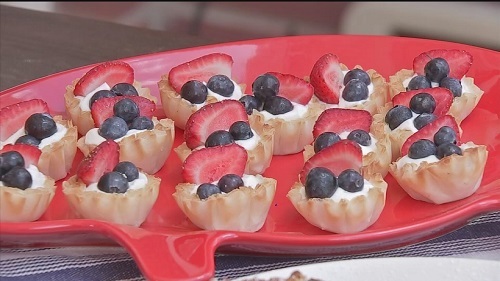 From the meat to the sweet treats, we've got you covered if you're throwing an Independence Day bash! One of the finalists for America's new Grill Star on Kelly and Michael is a Houstonian! 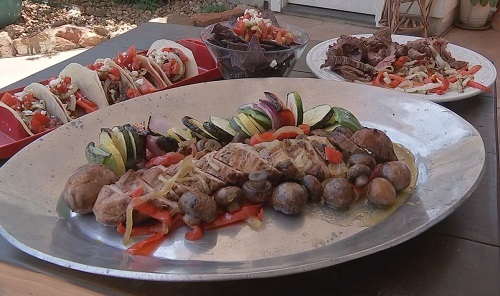 Tamie Joeckel is making her appearance on the show on Friday, but before heading to the Big Apple, she is sharing some of her grilling secrets with Eyewitness News, just in time for July 4th. To vote for her to be Kelly and Michael's Grill Star and for more of her recipes, click here! Heat oven to 350F (325F for dark or nonstick pan). Make and bake cake mix as directed on box for 13x9-inch pan. Cool completely in pan, about 1 hour. Pierce cooled cake with a straw at 1/2-inch intervals. In medium bowl, stir gelatin and boiling water until dissolved. Stir in cold water. Put mixture in a large measuring cup to pour. Carefully pour mixture over entire surface of cake. Refrigerate at least 3 hours until serving time. In large bowl, mix butter, cream cheese, vanilla and sugar. Spread over cake. 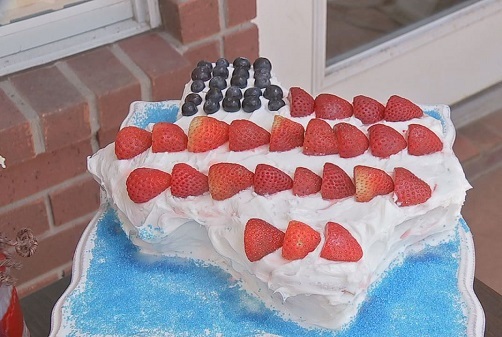 Arrange strawberries and blueberries on top of cake to look like flag. Store loosely covered in refrigerator. Beat cream in a small bowl until soft peaks form. Add sugar; beat until stiff. Fold in yogurt. Divide the yogurt cream among phyllo cups, keeping the cups in their plastic tray. Top each with 1 blueberry and 1 raspberry. Serve immediately, or chill for up to 4 hours. Heat water, mint leaves and sugar on the stove in a saucepan until mixture is boiling. Cook for 2 to 3 minutes. Remove from heat and discard mint leaves. Drop raspberries and blueberries and strawberries and blueberries in each mold. Fill with limeade and freeze. 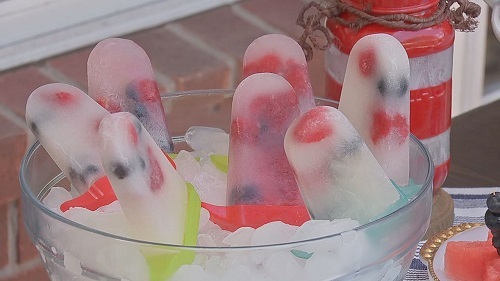 To remove popsicles after freezing, run warm water briefly over mold and pull out. Preheat oven to 400F. Lightly coat a 9-inch removable-bottom tart pan with cooking spray. Combine almonds and sugar in a food processor; pulse until the almonds are finely ground and incorporated with the sugar. Set aside 1/2 cup of the mixture. Add 1 1/3 cups flour and salt to the remaining sugar mixture and pulse briefly to blend. With the motor running, add butter a few pieces at a time until well incorporated. Stir egg yolk, vanilla and almond extracts together in a small bowl until blended. With the motor running, add to the processor and pulse until the mixture begins to clump and form a dough, about 1 minute (the mixture will look like crumbly sand). Set aside 1/3 cup of the mixture for the topping. Transfer the remaining dough to the prepared tart pan; spread evenly and press firmly into the bottom and up the sides to form a crust. Add the remaining 2 tablespoons flour to the reserved almond mixture; stir to blend. Gently toss raspberries with 2 tablespoons of this mixture in a medium bowl until coated. Spread the berries evenly in the tart pan. Sprinkle the remaining almond mixture over the berries. 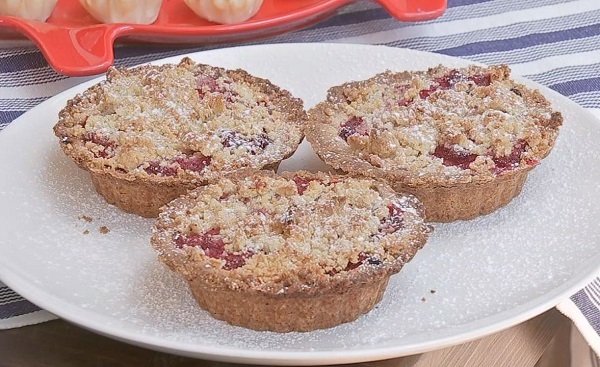 Pinch the reserved dough into small clumps to make crumbs and sprinkle the crumbs on top of the berries. Bake the tart for 15 minutes. Reduce the oven temperature to 350 and bake until the crust and crumbs are golden brown, about 45 minutes more. Let cool on a wire rack for about 30 minutes. Serve warm or at room temperature. Remove the pan sides; place confectioners' sugar in a fine sieve and dust the tart just before serving. Melt white chocolate per instructions in microwave. Dip 3/4 of the strawberry in melted chocolate. Let excess drip off. 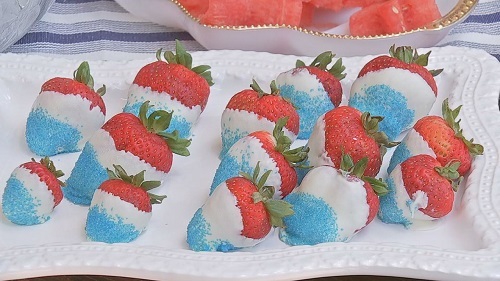 With a spoon, sprinkle blue sugar on the tips of each strawberry. Place on parchment paper and refrigerate until serving. Mix salt, pepper, lime juice, chili powder and garlic powder together. Slather over the skirt steak. Place in plastic bag and refrigerate at least 4 hours up to overnight. Melt butter in a bowl. Slice all veggies and toss with olive oil, salt and pepper. On a grill pan over medium heat, saute the peppers and onion until tender. Pour butter as they saute. To grill skirt steak, bring to room temperature. Sear over high heat on grill for 3 minutes each side. Remove from heat and toss with 2 to 3 tbl. garlic butter. Heat the tortillas in the microwave or on the grill. 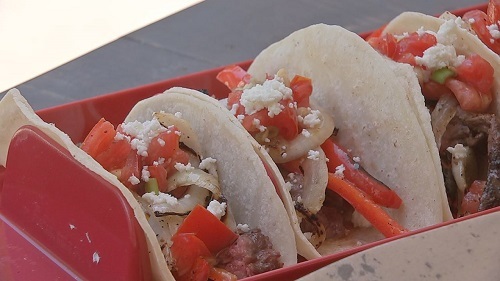 To serve the tacos, fill with steak, peppers, add a little cilantro and lime juice. Crumble queso on top and enjoy! You can make a batch of this delicious butter and it will keep in your refrigerator for a week to use on meats, veggies and in soups! Bring butter to room temp. Cut the end of each head of garlic and drizzle with olive oil. Wrap both in foil and place in oven. Bake for an hour to hour and a half. Remove from oven. When cool enough to handle, squeeze each head and the garlic will ooze out. Add to the softened butter and stir. You now have roasted garlic butter! Brown bacon in a skillet. Add onion and saute for 4 minutes until tender. Add garlic and saute another 2 minutes. Add the rest of the ingredients. And bring to a boil. Remove from heat and let cool. When cool enough to handle, pour mixture into a blender and puree. Retain 1/2 of the marinade in a plastic covered bowl. Pour the other half of the marinade in a plastic bag. Add the pork tenderloin and let it marinate for at least 4 hours up to 48 hours. To cook, remove the tenderloin from the marinade and discard the marinade from the plastic bag. Sear the tenderloins on each side on high heat for about 2 minutes each side. Create a foil packet. Add the tenderloins, mushrooms and onions and the marinade from the plastic bowl. Close the foil packet and cook over the low heat zone of the grill for an hour. To serve, pour the drippings into a saucepan. Add cup apricot preserves. Add more red pepper flake to taste (more if you like spicy, less if you don't).